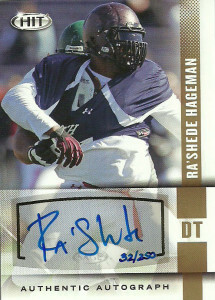 At 6’6″, 310 Ra’Shede Hageman was considered an intriguing prospect coming out of college. Originally a tight end and basketball player, Ra’Shede converted to defensive tackle as a Freshman. He appeared in 46 games at Minnesota, and finished his career with 91 tackles, with 10 sacks for minus 76 yards, 24 tackles for loss, two forced fumbles, and two blocked kicks. He displayed a nice blend of strength, size and athleticism that can translate to the NFL level. He was the top performer at the bench press (32 reps) and has rare leaping ability for his size which really impressed the scouts at the combine. Hageman however is considered raw talent with his lack of experience and background. The Falcons drafted Hageman in the second round of the 2014 draft and have slowly edged him into the lineup, finishing the season with 17 tackles and a sack. In 2015 Hageman had another 27 tackles and a sack.